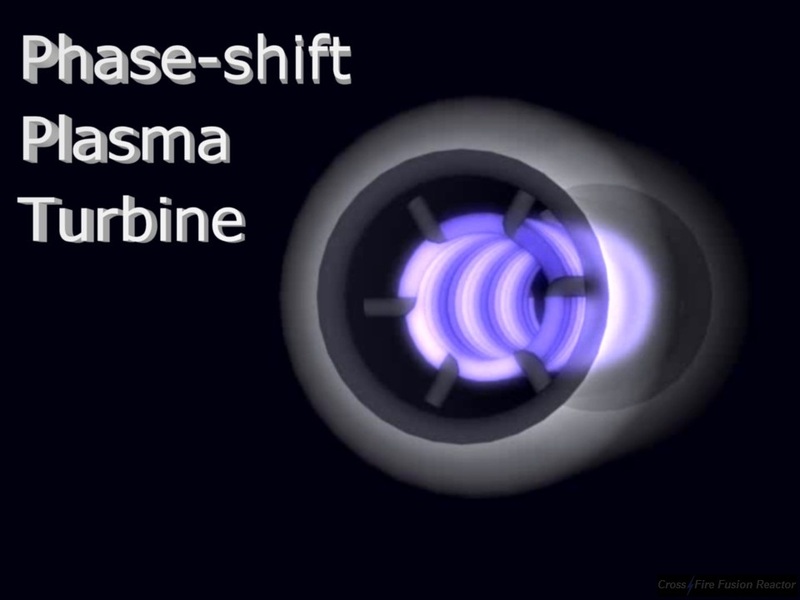 The Phase-shift Plasma Turbine is a modified version of the Electrodynamic Space Thruster in order to operate in atmospheric environments, mainly during takeoff, and in space to reuse exhaust gases from chemical rockets to boost the overall ISP, enhancing utilization of both energy and propellant. The Phase-shift Turbine uses a set of concentric coils, axially rotated in relation to each other, and feed by phased RF sources, producing radial and longitudinal sequences, which results in helical moving force, ionizing intake gas/particle/ion, generating continuous unidirectional thrust. In any expelling-mass propulsion system, power consumption increases exponentially with the exhaust velocity: Δv=ve*ln(mi/mf). - Lower ISP means higher propellant consumption. - Higher ISP means higher energy consumption. Hence, a reasonable balance/compromise between energy and propellant should be found. - and use clean and dense source of energy. Almost all RF thrusters (Pulsed Inductive Thruster, Magnetoplasma Rocket, Helicon Thruster, etc.) are mainly single-phase based instead of multiphasic. - phase rotation keeps plasma more centered. The Phase-shift Plasma Turbine can be comprised of six concentric coils, axially 60° rotated from each other, and by feed by six phases [0° 60° 120° 180° 240° 300°], optionally, not necessarily, placed inside a magnet to increase radial confinement of moving plasma. Internally, it can be coated with a reflective material. The six concentric coils, feed by six phases, produce a radial and longitudinal sequence, which results in helical moving force that, with proper frequency, can interact with any gas/particle (atmospheric, cosmic, ions, rocket exhaust) producing unidirectional thrust force. Neutral gases depend upon correct frequency to enter in the plasma state, e.g., 13.56MHz (frequency most commonly used for plasma processes). If a neutral gas cannot enter in plasma state, then it will be harder to be shifted than a non-neutral. Non-neutral gas, a positively charged one, can be produced with help of positive ion source, but it will require neutralization at output. b) forming pair (preferably counter-rotating) with another thruster having negatively charged gas produced with help of negative ion source. In both cases, neutralization/recombination will occur naturally far from spacecraft. where L is the axial length of one turn, r is the radius, and f is frequency. Note: 13.56MHz is the frequency most commonly used for plasma processes, but other frequencies can be used instead. E.g. : for neutral gases could be, but not necessarily, one pole per phase; non-neutral, two poles per phase. A spacecraft can take off from an atmospheric environment just using Phase-shift Plasma Turbines powered by Aneutronic Fusion Reactor; in this case, Earth's atmosphere will be used as propellant. At higher altitudes, retractile/moveable chemical rockets can align with intake of Phase-shift Turbines to increase the overall ISP to get into space. 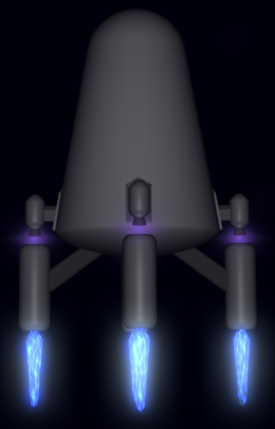 The Phase-shift Turbine will be a steadier step before development and test of the Relativistic Space Drive in deep space. Furthermore, the Phase-shift Turbine can be updated to be relativistic, coils shortened to more or less one turn, almost no surrounding fuselage, radially f≥c/(2πr) and longitudinally f≥c/L in order to twist spacetime. The Internet Encyclopedia of Science (Retrieved 2010-07-08) "Advanced Propulsion Concepts and Projects"
Glenn Research Center (Retrieved 2011-07-09) "High-Power Electromagnetic Thruster"
NASA - Advanced Space Propulsion Laboratory (Retrieved 2011-07-09) "Variable Specific Impulse Magnetoplasma Rocket" "Laboratory Experiment"
Earth and Space Sciences (Retrieved 2011-07-10) "High Power Helicon (HPH) Plasma Thruster"
Wikipedia (Retrieved 2011-07-15) "Strong focusing"
Advanced Light Source Controls Intranet Portal (Retrieved 2011-07-15) "Charged Particle Optics"
“Douglas” M. Ferreira Palte (July 08, 2011) "Phase-shift Plasma Turbine - Brief Presentation"